EWG scientists reviewed California Baby Aloe & Arnica Cream for safety according to the methodology outlined in our Skin Deep Cosmetics Database. We assess the ingredients listed on the labels of personal care products based on data in toxicity and regulatory databases, government and health agency assessments and the open scientific literature. 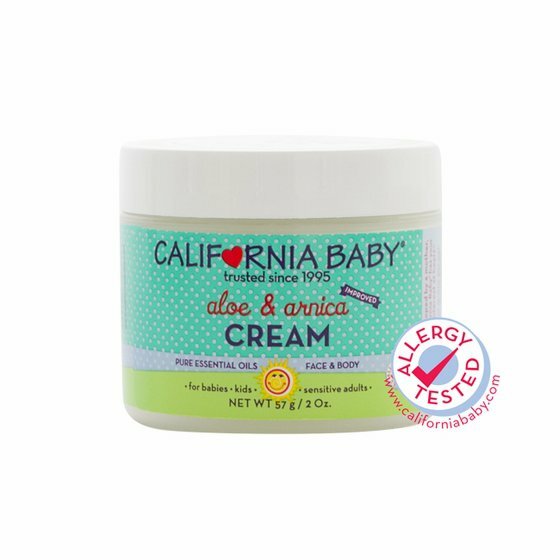 EWG's rating for California Baby Aloe & Arnica Cream is 2. Water, aloe barbadensis leaf juice (aloe vera), arnica montana (arnica) flower extract, caprylic/capric triglyceride*, glyceryl stearate*, cetearyl alcohol*, glyceryl caprylate*, vegetable glycerin USP*, cetyl alcohol*, canola oil, safflower seed oil polyglyceryl-4 esters, stearic acid*, yucca schidigera root extract (yucca), viola tricolor extract (pansy), calendula officinalis extract (calendula), carthamus tinctorius (safflower) oleosomes, allantoin, levulinic acid, oenothera biennis (evening primrose) oil, rosmarinus officinalis (rosemary) leaf extract**, xanthan gum USP, p-anisic acid, pure essential oils of lavandula angustifolia (French lavender) and salvia sclarea (clary sage), phytic acid (rice origin).